Properties in Cape Verde average 4.4 out of 5 stars. Property 5: Penthouse AIR CON Apartment On Beach front Complex. Property 19: Apartment with strong emotions overlooking the Gulf of Mindelo !!! Property 22: Peaceful Porto Antigo Lux 1 Bed Apt Views pool/sea. All mod cons, Air con/wifi. Spacious,Seafront Lux 2 Bed/2 Bath Apt Sea & Pool Views.WiFi. AirCon. Property 23: Spacious,Seafront Lux 2 Bed/2 Bath Apt Sea & Pool Views.WiFi. AirCon. Modern 2 bedroom apartment with balcony in well kept resort. 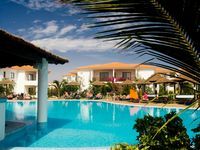 Property 43: Modern 2 bedroom apartment with balcony in well kept resort. Me and my wife enjoyed our winter break in Rebecca's apartment. It was in a great location overlooking swimming pool and a 2 minute stroll through resort to lovely beach, which was pretty quiet in the last week of March. The apartment was comfortable and spacious with plenty of facilities. We didn't eat or drink on the all inclusive resort( although you do have that option ) but went into Santa Maria which is a cheap taxi ride or about a 30-40 minute walk, longer if you take the beach route. There are quite a few restaurants and bars in town with some playing live music which gave the town a nice little vibe. Meals were a challenge as I am Vegan and there isn't a lot of choice. Just make sure you explain the difference between vegan and vegetarian. Restaurant &quot;By Valeria&quot; did have some options and listened to requests. If you fancy a pizza anywhere just say no cheese, very nice vegetarian pizza ( no cheese ) at Palm Beach. Overall nice break and Rebecca always helpful and available with advice when needed. We would return. Great stay, really nice apartment on a fantastic resort. The owner could not do enough to help. Lovely property - ideal for family of three. Would definitely come again.